What is an Upward Sports™ Entertainer? Upward Sports™ Entertainer – an individual or group who performs and presents the Christian Gospel for the closing awards ceremony of a local Upward™ Sports league. That’s the basic definition. The goal of this outline is to be informative and helpful for Upward Sports™ league directors, Upward Sports™ parents/family members, Upward Sports™ participants, Upward Sports™ volunteers, and anyone who is curious to learn more about the Upward Sports™ closing ceremony program. Author’s note: I have had the privilege of being an entertainer for over 100 Upward awards programs. I am on the Upward Sports™ endorsed speakers list. I am not on staff at Upward Sports™. I simply partner with local leagues to help them have a great closing ceremony. What I say here is my opinion based on my observations of working with many local leagues. If you want the official low-down about Upward Sports™ sports, please check out their main website. If you’re a league director, refer to the materials that Upward Sports™ provides for you. These are simply some tips and suggestions from one of their endorsed entertainers. As of the writing of this, Upward Sports™ is the “world’s largest Christian sports league for children” (quoted from the Upward Sports™ website), serving over half a million kids and their families through some 5,000 sports leagues or camps. They have basketball, cheerleading, soccer, and flag football for kids and youth. At the end of the season, each local league hosts a free awards ceremony for the players, families, and the community. The goal of this ceremony is to celebrate the kids and what God has done in their lives all season long. Another goal is to deliver a clear presentation of the Gospel of Jesus Christ with an opportunity for people to respond, and this is often done by bringing in a speaker/entertainer who delivers the message and challenges the crowd. What does the Upward Sports™ Entertainer do? First of all, Upward Sports™ entertainers are not official Upward Sports™ staff or employees. They partner with each local church/league to help execute a great awards ceremony. 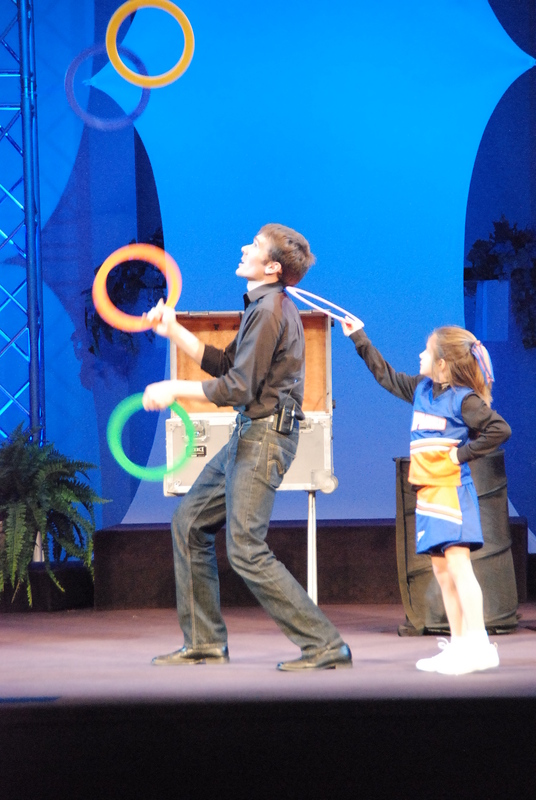 There are Upward Sports™ entertainers who are on the Upward Sports™-endorsed list and those who are not. If you’re a league director, you should do your own homework to find the right program for your ceremony whether you choose from the endorsed list or not. The endorsed list is privately available to league directors when they login to the Upward website. There is a rigorous application and screening process for entertainers to be endorsed by Upward Sports™. Many of the entertainers have a unique talent that appeals to the kids, such as ball-handling, illusions, ventriloquism, juggling, comedy, singing, clowning, stunts, bike tricks, or other motivational and variety entertainment. They often perform for 30-40 minutes and somehow close with a challenge to follow Jesus Christ. Each program looks different. The rest of the awards ceremony is time for the league director to thank people, recognize the players, have the cheerleaders do a cheer, and other related things. Be Time Efficient: There’s nothing worse than the never-ending awards ceremony. I think an hour is a good amount of time to recognize everyone, do a cheer, announce the teams, have some entertainment, and challenge the crowd to follow Jesus. Be Super Energetic: Another common fallacy is the boring emcee or announcer. Make sure that everyone in the spotlight has joy and energy because this is a celebration! Be Hospitable and Authentic: Many families attending are not regular church folks. Make sure you greet people, make them feel welcome, and genuinely invite them to enjoy themselves and listen to a positive message for the evening. Tell them about your weekend church services but don’t pressure them to join or give money. Be Clear About Closing: I have worked with many different types of churches and denominations and each one has a different way of closing and challenging people to respond to the message of Jesus Christ. Upward Sports™ provides these great response/evaluation cards that let people mark how they want to respond to the message and/or be followed up with. The style in which this is executed might look different from church to church, but make sure you are clear with your leaders and the entertainer about how this is going to look and who’s going to explain the response time. Follow the Upward Sports™ Handbook: Upward Sports™ is a super-organized operation. They are a well-oiled machine that has a reason for everything it does. They provide resources for league directors about how to have a great closing ceremony. Refer to that handbook and do what they say, and you’ll do great! Jesse Joyner – That’s me! Read all about my ministry by starting at my home page and exploring from there. While I would love to do your Upward Sports™ awards night, you might want to compare some other great entertainers, so here are my referrals…. After reading this article, I am left with the sense that your understanding of this subject is significantly greater than the other blogs I have seen. Thanks a lot.